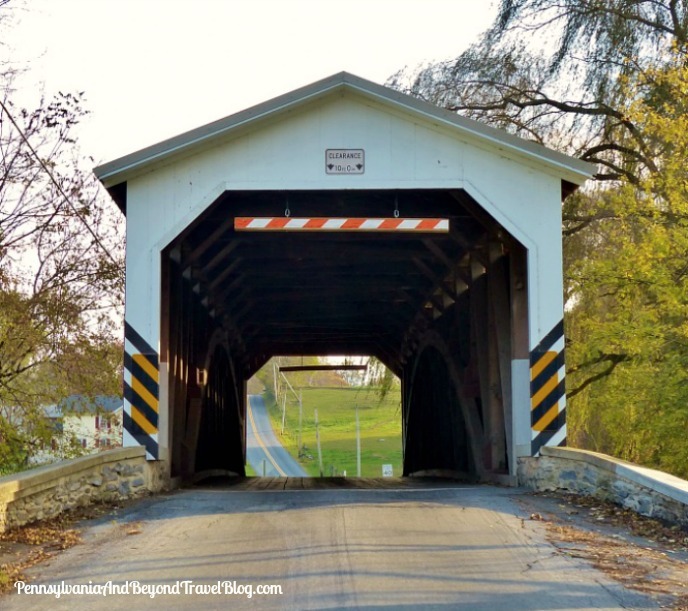 Pennsylvania is known for its historic covered bridges and you'll find 29 of them in Lancaster County. The majority of them are painted in the traditional Lancaster County barn red color with the approaches painted in white or red with white trim. The Leaman's Place Covered Bridge spans the Pequea Creek and is also known as Eshelman's Mill Covered Bridge and Paradise Bridge. It measures 113 feet long by 15 feet wide. It was built in 1845 by James C. Carpenter and was rebuilt and refurbished over the years. You can find it located north of U.S. Route 30 on Belmont Road to the west of Paradise, in Lancaster County, Pennsylvania. The bridge has a single span, wooden, double Burr arch trusses design with the addition of steel hanger rods. The deck is made from oak planks. It is painted red, the traditional color of Lancaster County covered bridges, on both the inside and outside. Both approaches to the bridge are painted in the traditional white color. On the day that we visited, we had the opportunity to see an Amish Horse & Buggy on the bridge, which was really cool to see. In this particular area, you'll see many of them on the roads. When it comes to covered bridges, this is one of the smaller ones that we've seen in the area, but still very beautiful to see! If you're into seeing covered bridges, you'll find several other's within the county.